Would you rather be frozen, dehydrated, or incinerated? *NOTE* This article contains information that might be disturbing to some individuals. Many of the attached links do have VERY graphic images. Use your own discretion when following them off-site. Before we dive into the decomposition process, let me congratulate you on your brief journey into space. You, my friend, are now a member of a very exclusive group of individuals to have ventured above and beyond Earth’s horizon. The bad news is that, without a proper spacesuit, you are not long for this world. 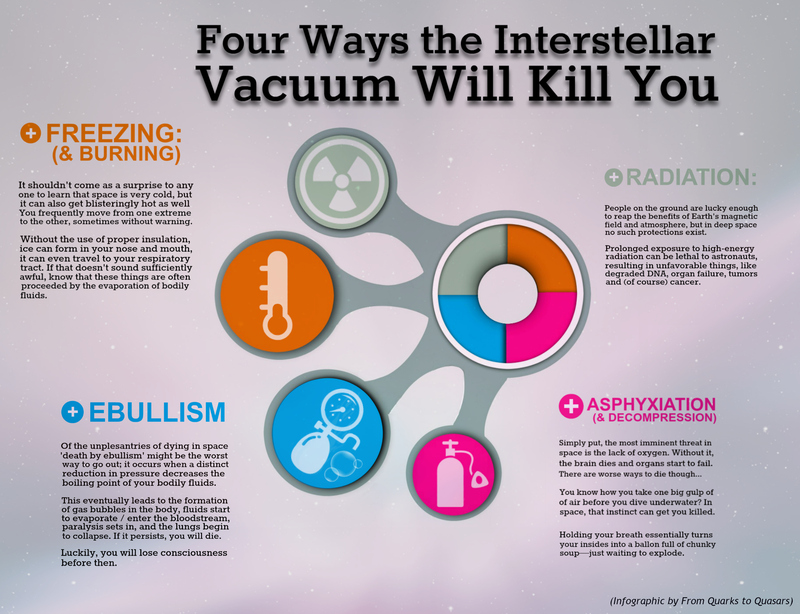 As we’ve discussed previously, exposure to a vacuum will do you in, in a number of undesirable ways. Hopefully, you will be granted a quick death, but unfortunately, that may not be the case. If you have ever been in close proximity to a recently deceased person, you might have noticed that the body begins undergoing various changes immediately after death. The most apparent changes are pallor mortis (a paleness overtaking the body) and something called lividity (also known as livor mortis). After death, when the heart is no longer able to pump blood throughout the body, gravity takes hold and the blood begins to pool in dependent portions of the body (the ones that are closer to the ground). The heavier red blood cells sink as well, causing purple, bruise-like splotches to appear on the skin — a surefire sign of death. Shortly afterward, rigor mortis sets in. During this phase of decomposition, the limbs become very rigid and inflexible. It’s kind of like the muscles that make up the body were removed and replaced with concrete. All the while, the body begins to cool rapidly, a process called algor mortis. The progression of this can vary based on a number of factors, including the location of the body, the time of year, the person’s body fat, and any drugs or medications that might have been taken prior to death. A combination of the above principles can help coroners determine when a person passed on, and in forensic pathology, they can be used to determine whether the deceased was moved to the location where they were found. This, in turn, can help establish whether or not the death is suspicious in nature. Now, while some of these postmortem changes can be rather jarring, they are merely a small sample of what’s to come. After the effects of pallor mortis, livor mortis, algor mortis, and rigor mortis set in and (mostly) dissipate (a process typically lasting several days), bacteria start to run amok. First, saprobic bacteria get to work, eating away at tissue, muscle, and internal organs — most of those are now in the initial stages of putrefaction, a process during which enzymes and anaerobic bacteria break internal organs apart piece-by-piece, causing them to liquify. As a result, acid and gases cause the body to bloat and smell. Some of this exits the body through various orifices, while the bulk of it builds up steadily until the skin ruptures (imagine filling a water balloon with chunky tomato soup, then try sticking a pin in it). Ultimately, the deceased is virtually unrecognizable at this point, not that you would want to get close enough to look for identifying features — the smell would knock you off your feet. Though the worst part is over, the horror continues. I’ll spare you the rest of the details, and just emphasize the fact that different types of bacteria play a large role in the decomposition process. Here on Earth, we have many methods of delaying the full effects from manifesting, namely embalming. In that process, a person is drained of their blood, which is then replaced by a cocktail of different chemicals, including formaldehyde. This preserves the body at least long enough for friends and family to say goodbye during a viewing. In space, a few different scenarios can play out. First, we have death and decomposition without a space suit. In this scenario, without an internal source of heat and assuming that you are close to something that can transfer your body heat (and that this “something” is not a star or something similarly hot), the body could freeze solid pretty quickly, putting “from dust to dust” on hold indefinitely. We actually don’t know how long it would take for a body to entirely decompose this way, so it’s conceivable that the body could be preserved forever, or at least for a really darn long time. But, as I said, that assumes that the frozen corpse doesn’t venture too close to a star, black hole, or other celestial body. If it does, space radiation would rip through the body like a firestorm, as it won’t be shielded by an atmosphere (like we are here on Earth). Now, assuming death takes place within close proximity to an external source of heat — for example, the outermost envelope of Earth’s atmosphere, where the temperatures are quite warm, but not hot enough to result in incineration — the body, which is largely composed of water, would dry out quickly, taking on a leather-like quality (like beef jerky). Furthermore, the vacuum of space sans spacesuit would also effectively sterilize the human and any bacteria still inhabiting them. Coupled with the fact that bacteria are key to the decomposition process, it seems rather unlikely that the body would decompose in short order in this scenario. Now, with a spacesuit’s protection from the elements, the decomposition process would likely be accelerated, though the extent of that remains to be seen, since no one has died in space from exposure. Upon death, the bacteria in a spacesuit would quickly start dining on the body as cellular death takes hold, slowly breaking the body apart in various stages. This would only be applicable if a source of heat remained. If not, we’d go back to the same predicament as before, with the body freezing before bacteria have an opportunity to feed and multiply. Either way you go about it, death, in and of itself, is nothing gross, repulsive, or morbid. In fact, it’s pretty much a rite of passage for all of us. By discussing things often deemed uncomfortable, we can gain a deeper understanding of the complexity of nature and of ourselves.